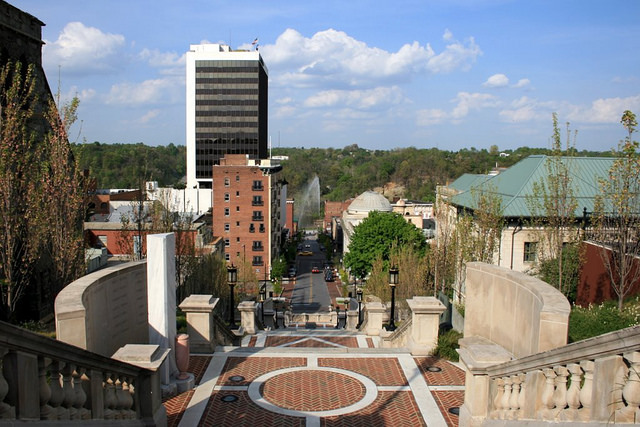 Lynchburg is “the City of Opportunity” for a reason. Lynchburg is leading the way with new innovations every day, home to numerous premier industries and major corporations that are supplementing the region's flourishing $8.74 billion economy (Opportunity Lynchburg). Read below to find out more about Lynchburg's top performing industries as well as a look into the history of Lynchburg. Lynchburg is where it is today because of John Lynch’s innovative idea. During the mid 1750’s the colonial village of New London, Virginia operated as a profitable trading center for the region. However, due to the James River, the village of New London needed a solution to reach neighboring areas such as Charlottesville to further expand their business. John Lynch resolved this problem by developing a ferry service for the local community. His business endeavor proved to be tremendously successful! Because of the ferry service, the newly formed village of “Lynch’s Ferry” began to operate as its own trading center. In 1786, a charter was granted and the town changed its name to “Lynchburg”. Today, Lynchburg’s industries have shifted to accommodate new and exciting business endeavors. During the school season, Lynchburg becomes a college hub hosting an estimated 23,000 students (Opportunity Lynchburg). The largest, Liberty University, has a combined resident and online enrollment exceeding 110,000. In order to host such a large student body, Liberty University recruits over 2,500 employees which makes them one of the biggest employers in the area. Even though Lynchburg has strong roots in manufacturing and higher education, the insurance industry is also expanding. Two of the top ranking insurance corporations have locations here locally, Genworth and Pacific Life. Genworth has two sectors in Lynchburg. One functions as a life insurance company and the other assists with financial planning. The two branches combine to 1,200 employees. In 2016, Pacific Life announced it would be investing $4 million dollars into Lynchburg by bringing more than 300 jobs. Since then, they have contributed greatly to Lynchburg’s economy as well as made charitable donations to local non-profits. Many residents do not realize that Lynchburg is making a sizeable impact on the nuclear energy field. Currently, two nuclear energy service providers fully operate here locally. Areva, an international nuclear power company, has one of its branches here locally. They strive to bring nuclear energy opportunities to the U.S. and Canada. BWXT is another local nuclear energy service provider. They operate as a global leader in energy and environmental technology services. They currently have 2,150 employees based in Lynchburg alone. As time has goes on, one undeniable fact will ring true about Lynchburg, the industrial roots established at the creation of our city are still present in today’s economy. When Lynchburg was founded more than 230 years ago, a strong structure was laid for businesses to expand and grow into the booming corporations they are today. So what does the future hold for the Hill City? Currently we are seeing more businesses that are planning to relocate to Lynchburg. For example, Convergys Corporation announced it would be creating a call center that would bring 600 jobs to the city. We take pride in all of the accomplishments made by Lynchburg’s thriving industries. As we look to the future, we can firmly state that future for the “City of Opportunity” is bright.